Mechanical pencils are casually being used by many. Choosing a good mechanical pencil will make you more productive at work or school! When you say mechanical pencil, there are those for drafting, ultra-thin 0.3 mm type, unbreakable lead, and a lot of other features from Pentel, Pilot, Uni and other brands. We will now be discussing the pointers on how to choose a mechanical pencil. We’ve also compiled a lost of best mechanical pencils. 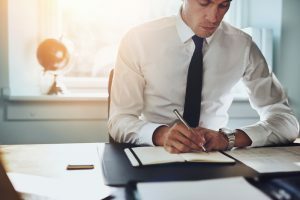 We will include products with great design and a lot of features, which are easy to write with, so use this article as a reference when finding the perfect mechanical pencil for you. There are a lot of kinds of mechanical pencils, so choosing the perfect one can be very difficult. For such people, we will be discussing the points you need to check before purchasing a mechanical pencil. We all have different taste and preferences, so try choosing the one that matches yours! The body or grip diameter is a very important factor as it can affect the way it fits your hand, and if you get tired or not, while using it. The hand size and pencil pressure differ from one person to another, so choose the thickness that matches your hand. Thin mechanical pencils are difficult to grip tightly, so using a those with a wider body allows you to grip it naturally. This type is recommended for those people who tend to write with a lot of pressure. 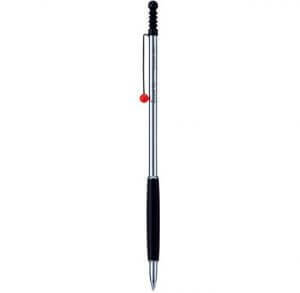 Not only it is not tiring to use but also it will also help you to hold your pen in a correct way. 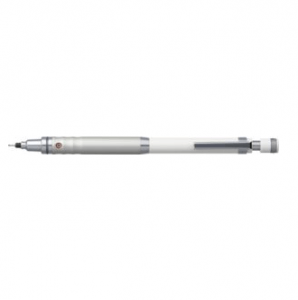 It needs less power to control a thinner pen, so it is recommended for those who write with a light hand. Basically, this type is recommended for drawing details. Preference depends on the person, but the weight also is a factor on whether or not a mechanical pencil is easy to write with. We will show you the characteristics of each, hope this helps when choosing your mechanical pencil. With a heavier mechanical pencil you can write with just its weight, so you won’t need to put much pressure when writing. It is easier to control, so you can write a stable line or letters perfectly. Though you may need a little bit of strength in holding it, therefore it is not recommended for those with weak arms. 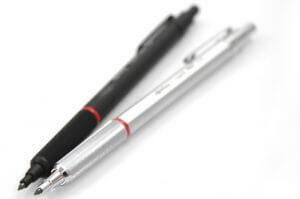 With a lighter mechanical pencil, you won’t need any strength to hold it, so you can write fast. Though you will need to apply a bit of pressure when controlling it, which can be a bit tiring and harder to control than a heavy one. Depending on the material, the weight and the way it fits your hand can change. There are those made with plastic, metal, wood, etc., so choose the material that matches your hand. Plastic is the most common material used for mechanical pencils. It is light-weight and more affordable than the others. It also has a lot of variations. Its durability is not that great, and not recommended for long time use, as your hands may sweat and plastic mechanical pencils can get slippery. A lot of drafting mechanical pencil or expensive brands use metal, despite it being a heavier material. It’s very durable, which means you can use it for a long time before you have to buy a new one. A material with chic texture, and a bit heavy. It won’t slip even if your hands get a little sweaty. The disadvantage is that you cannot find many variations of this type. But if want to use a more unique mechanical pencil, wood is the best material for you. The most common lead size is 0.5 mm, but the lead size you can use will depend on your mechanical pencil. Thick lead won’t break easily, and you can use it just like a pencil. Not the best for detailed work, but this is perfect for children who will be using a mechanical pencil for the first time. On the other hand, thin lead is perfect for little details like drafting. Remember that it breaks easily, so it is suited for those with weak pencil pressure. Ask yourself “Is my pencil pressure is high or low?” and choose the product that matches your preference. 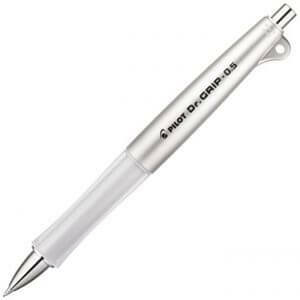 The grip will directly affect if the mechanical pencil is tiring to use or not. Choose the one that won’t slip for a sturdier grip, as well as a good fit for your hand. Those with soft grips are not only non-slippery, but also reduces the pressure on your fingers, so this is recommended to those who easily develop callouses from holding a pen. Hard grips, on the other hand, are easy to control. Although you might get callus with a high pencil pressure and fast writing, hard grips are suited for writing/drawing the details. 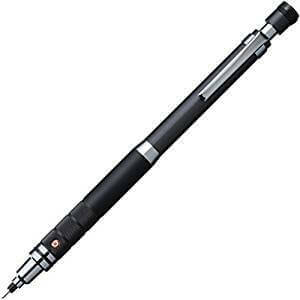 If you are looking for something that is easy to write with, choose a pen that has the center of gravity at its low part. Most of drafting mechanical pencils have its center of gravity at the low part because of its metallic grips, so they tend to be easy to write with. Now we will show you the best mechanical pencils in rank order. There are a lot of different mechanical pencils available. We hope you can use this as a reference! This mechanical pencil has one of the softest grips on the market. It uses Alpha Gel for its grip, which gives perfect fit of the grip for users and enables long writing with great comfortability. 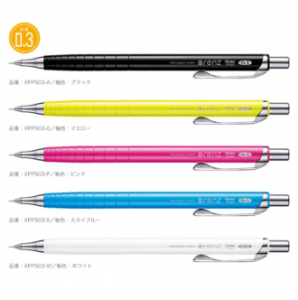 Although it has a mechanical body, its durability is weaker than other metallic pencils because of its gel grip. However, if you have many papers to write in a day and need a way to prevent callouses, this might be the right mechanical pencil for you. This mechanical pencil has won several design awards such as the Red Dot Design Award, iF Product Design Award and Design Plus. Its ultra-thin design comes with the complete weight balance for smoother writing experience. You can always keep this pencil in the pocket of your jacket for a good accent. 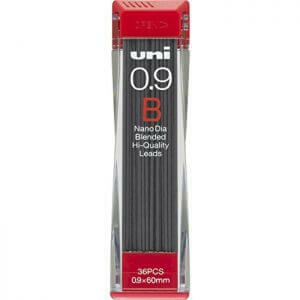 If you are looking for a mechanical pencil for a present, this is the best product for you. 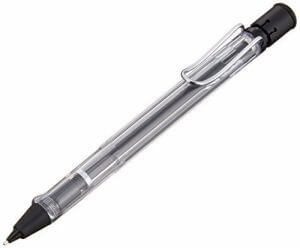 As the lead gradually shortens while you are writing, the sleeve automatically slides back, so there is no need to knock the button every time you need more lead. Also, the sleeve protects the lead from breaking. It is perfect for those who have priority in the writing speed and find it annoying to have to stop writing for a while for the lead to come out. This pencil is for 0.3 mm lead, so you can easily draw details with it. Each time you write, the lead rotates slightly. This feature keeps the tip of the lead sharp so that you can write sharp letters without rotating the pencil by yourself. This feature is very convenient for when you are in the zone and want to write fast and continuously. Its metal body assures its high durability as well. 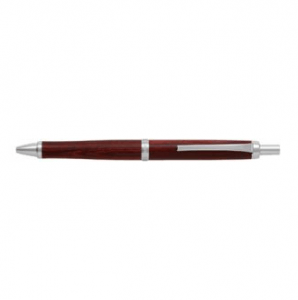 Wooden Mechanical Pencil Perfect for Drafting Fine Details! 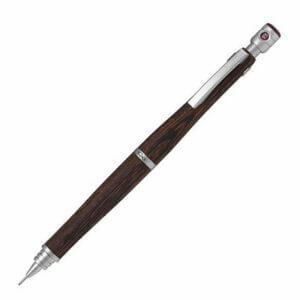 This mechanical pencil has an elegant design with a very smooth wooden body with a low center of gravity and thick body for more stability. Its texture provides a nice grip, that won’t slip while you are writing with it. Some consumers argue that this pencil is a bit too heavy for them, so it is recommended for those who with a good arm strength. It has an expensive price tag compared to other mechanical pencils, but if you like to use 1 pencil for a long time, it is the best choice for you. Have you ever been frustrated with breaking lead while writing? I bet you have! 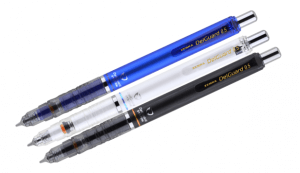 DelGuard mechanism absorbs the pencil pressure internally to avoid breakage. It has 2 small springs inside the grip and tip, which absorb the pencil pressure with any writing style, vertically or on an angle. Its grip also has some texture for a more comfortable writing experience. 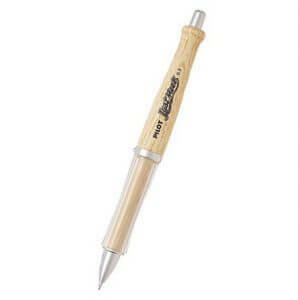 With its DelGuruard Mechanism, it is recommended for those who have high pencil pressure and often break pencil leads. 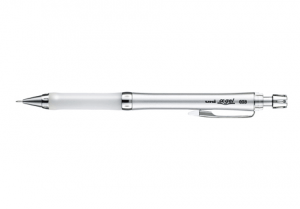 This mechanical pencil is on the expensive side, but you will not be disappointed. 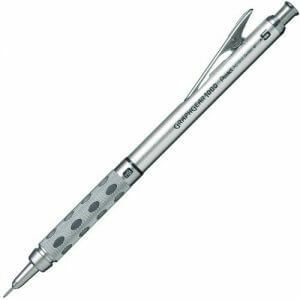 A lot of people swear by this mechanical pencil and are saying that it surpasses other products by a huge margin. With its long sleeve, it can be recommended for drawing purposes as well. Highly recommended for professionals who draw and write a lot. 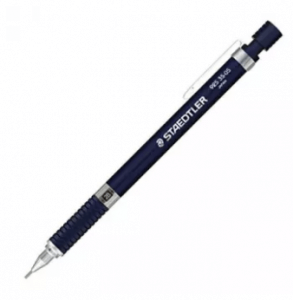 Very durable too, and it is made by one of the best brands in the school and office supplies industry, Staedtler. 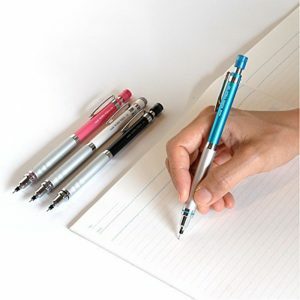 Even if you purchased a nice mechanical pencil, it is possible that your hands get tired easily or get a callous on your fingers from constant writing. So we show you the tips on how to hold your mechanical pencil the correct way. 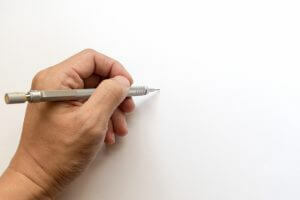 If you hold it the right way can lessen the burden on your hands, your handwriting will naturally become neater. Basically, you need to grip it with your thumb, index finger, and middle finger, leaving the ring finger and pinky, to lessen the burden on your hands and make it more stable. For those with callouses already on fingers other than the middle finger, it means that you have too much force on your hands, so try to relax a little bit more. Always keep in mind that your pencil is not in a vertical position. Until you’re completely used to it, practice writing just 1 word per day until you perfect the correct way to hold it. Each mechanical pencil has its own unique feature, so choose the one that fits your daily needs to improve your productivity at school or work.